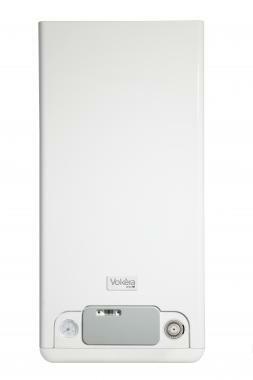 The Vokera Unica HE is a high-efficiency combi gas boiler offering excellent performance benefits and cutting running costs by up to 35% compared to other similar spec models. It's SEDBUK 2009 rated as 'B' with low emissions - of interest to environmentally-conscious customers. Designed to be easy to install and fit the Vokera Unica HE pipework can be fitted before the boiler's in place. It has an easy-to-fit condenser connection and is already factory set when delivered (and ready tested) which shortens the time needed to get it up and running! The heat exchange has patented technology - with excellent thermal transfer and a minimised risk of corrosion. The model also has the standard Vokera pipework which helps make it easy when replacing older models. Its flow rate is also the highest of all the entry-level model boilers in the current market! This model has very easy-to-use features. For example an automatic 'self-start' programme stops the internal pump & valve from sticking during long 'switch off' periods. There's also an anti-cycling device which cuts wear and tear and inbuilt frost protection prevents problems in deepest Winter! The control panel is intuitive - and don't forget the 'look' - this boiler has stylish compact Italian finishing. This boiler is recommended by the Energy Saving Trust.